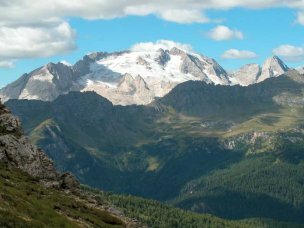 A long, irregular ridge of dark rocks, aligned from the Pordoi pass to Roccapietore, the Padon divides the Livinallongo from the valley of the Pettorina stream and is known to the average tourist mostly as a frame that hides or outlines the magnificent view of the Marmolada. Several peaks are aligned along the Padon chain, none of which is specially high (west to east, Col de Cuch, m 2563, the typically-shaped Sas Ciapel (Hut Stone) m 2557, the Forfesc (Scissors) m 2585, the Belvedere m 2650, Sas de Mezdì m 2727, the Mesola m 2642, the Padon proper m 2512; then the chain splits and we have the Col de Scote m 2265 North, towards Pieve di Livinallongo, and the Migon or Migogn m 2384 South, towards Roccapietore. The dark rocks of the Padon mostly consist of volcanic ashes and stones erupted during the Ladinian (Middle Trias) and compacted later on. In that period the Dolomites represented a subduction zone of the earth crust and were subjected to the action of at least two volcanoes. 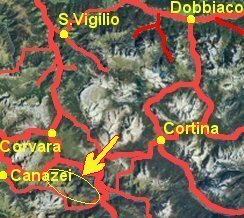 In the Fanes' saga the Padon is mentioned: 1) as the site of the fabulous mine of Aurona, 2) as the Vögl delle Velme's home, 3) as the place where Ey-de-Net looks for Tsicuta'home "seven days long", to no avail. The first point must be denied: the Aurona was the archetype of all copper mines, and it can't be localized anywhere. Probably, then, the statement that the Aurona was located in the Padon is derived by the idea (that has nothing to share with the Fanes) that the Padon's rock had turned black "by the smoke of the ovens of the Aurona". There is indeed a "ru d'Aurona", a stream flowing down from the Padon to Arabba, but the name can easily be derived from the legend, instead of vice-versa. As far as the Vögl delle Velme is concerned, legend says that he used keeping his feet in the water of the ru d'Aurona when he was in a good temper, while he stayed between the Forfesc when gloomy. We must remark that the coincidence of a Sass de Mezdì (Midday Peak) due South of a ru d'Aurona, connected with an old man who knew everything because the spirits of the water kept him informed, immediately reminds of a sacred place of the water-sun-mountain type, like others we already met (e.g. in the Costeana valley). Unfortunatey we aren't told any further detail. About the Migogn, finally, we shall discuss later in connection with Tsicuta and her home. between the Padon and the Marmolada, the Fedaia lake). Excursions: from the Castiglioni hut near the Fedaia lake (m 2054) along the pathway named Vial del Pan, through the Vial del Pan hut m 2436 to Baita Fregarola hut m 2388, 2 hs. ; to the Pordoi pass m 2239, 1/2 hs. Wide and continuous view over the Marmolada and what remains of its glacier. Detour possible to porta Vescovo hut, m 2516, from where a cable lift descends to Arabba. From porta Vescovo, the difficult and exposed Ferrata delle Trincee ("aided climb of the Trenches"; war remains) brings in about 3 hs. to Passo Padon hut m 2407, from where an easy path brings back to the Fedaia lake.